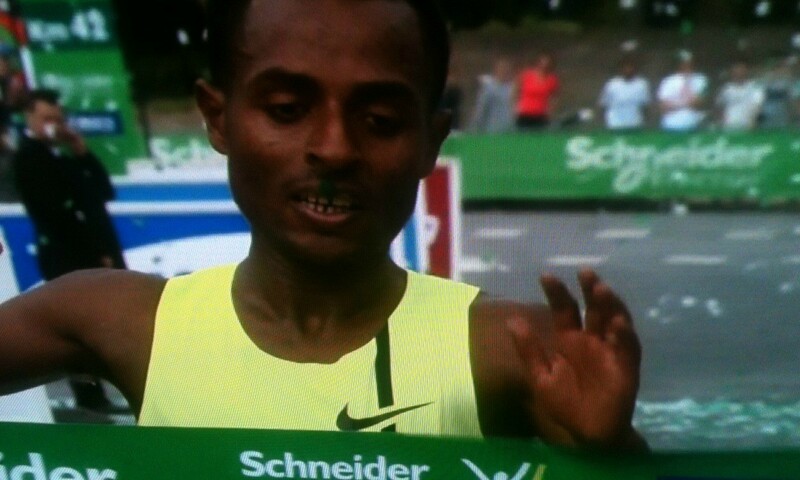 The world 5000m and 10,000m record-holder, Kenenisa Bekele, set a course record of 2:05:03 in Paris on his marathon debut. Despite suffering from leg cramps in the latter stages, the Ethiopian looked strong and relaxed as he powered away from his rivals in the latter stages to win by almost two minutes. Bekele had somewhat controversially avoided the Virgin Money London Marathon, which takes place next Sunday, and a clash with Mo Farah, Wilson Kipsang and others. Instead, he preferred to make a debut in a marathon he could control – and it proved a good decision as he cruised away to beat fellow Ethiopian Limenih Getachew, who clocked 2:06:49 in second. For a while it looked like Bekele might also threaten the fastest debut time on a certified course – Dennis Kimetto’s 2:04:16 from Berlin in 2012 – but he had to settle for breaking Stanley Biwott’s course record of 2:05:11. In fact, Bekele’s time was the sixth fastest debut in history, or seventh fastest if you include Moses Mosop’s 2:03:06 on a downhill Boston course in 2011. Flomena Cheyech of Kenya won the women’s race in 2:22:41.